Market your organization, product or service to our webinar audience averaging more than 400 ag retailers and agribusiness professionals. Detail your product or service benefits, or promote your organization to ag retailers interested in maximizing revenue, return on investment for their farmer clients, and voluntarily addressing critical environmental resources including water quality. Increase trade viewership of your products, services and organization through our website, email and social media webinar promotions. 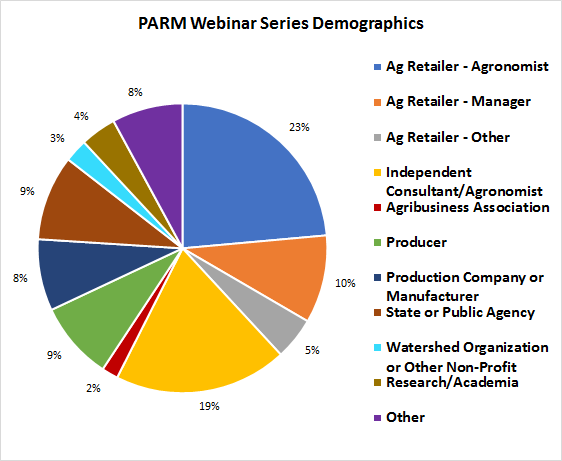 Our webinars present science-based, credible information on ag retail products and services to live plus on-demand viewers. This is a great opportunity to reach an audience engaged in improving revenues, input use efficiency, return on investment and the critical water resources we all depend on for irrigation, fisheries, recreation, tourism, and drinking water. Our webinars average over 400 viewers! Ag retailer employees and independent consultants make up the largest portion of participants. Our participants also include agribusiness associations, production companies and manufacturers, research academia, state and public agencies, watershed organizations and other non-profits. Receive five minutes during our webinar to introduce your organization, product and/or service. Your organization/product/service will be promoted through our webinar email campaign, on our website and on social media. Sponsor three PARM webinars: $1300 Save $200! Sponsor five PARM webinars: $2100 Save $400! Receive all Platinum Level benefits, plus your organization/product promoted in our newsletter, a circulation totaling over 5000 ag retailer and agribusiness contacts! Sponsor three PARM webinars: $2700 Save $300! Sponsor five PARM webinars: $4500 Save $500!